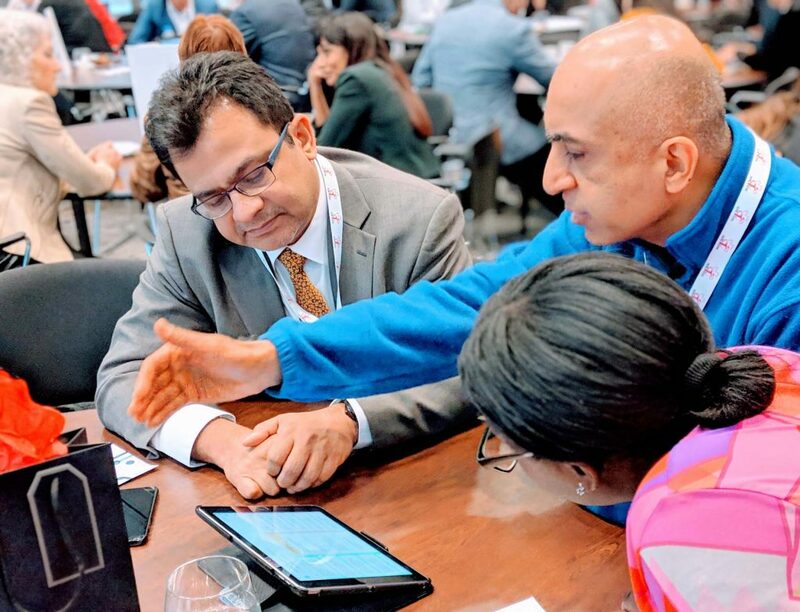 How we used digital facilitation to engage over 70 participants in bridging the digital education and skills divide. How might a large network of industry, educational institutions, and policy makers collaborate to bridge the digital education and skills divide? The summit included a keynote speaker, expert panels and two interactive discussion sessions led by our expert facilitators. The 70+ participants who we were to engage in the interactive discussions had very diverse sets of knowledge and experience. The key objective was to have each person own the call for individual and collective action. After meeting with the summit organizers, we designed a draft agenda for the interactive discussion sessions. Anticipating that people would work in groups of three, we rented an iPad for each group and programmed the interactive exercises into the Stormz Platform. 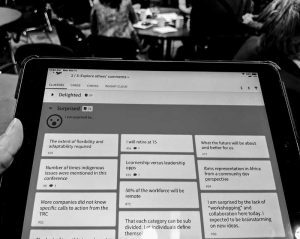 Stormz is our favourite digital facilitation tool for harnessing the collective intelligence of any size group. We know from experience that you can’t always rely on a venue’s WiFi, especially for real-time collaboration of 70+ participants. With this in mind, we brought in the StormzBox: a secure and local server in a box. Using this technology we ensured that all inputs were displayed in real time on the large screens while also ensuring that all data was kept confidential and off the cloud. Our facilitation approach was to host two Breakout Sessions and an “Open Space” for wishful thinking. For the formal breakouts, audience participants were asked to assemble into teams of three, as triads are the strongest structure for group collaboration. Each triad was given a pre-loaded iPad with a customized workshop flow. Introduce yourselves to each other. What concerns came up for you? In Stormz, have a look at everyone’s contributions. If you see a card that you agree with or want to comment on, click on that card. Facilitator does a room-wide share in Stormz of the responses with the most votes. Between the breakout sessions, we set up an Open Space in Stormz and invited participants to populate the “Wishful Thinking” space. What do you wish could happen in the short term (within the next year or 2)? What do you wish could happen in the medium term (within the next 3 to 5 years)? What do you wish could happen in the long term (in 6 or more years)? We invited participants to switch into new triads to change the energy in the room and to invite new networking opportunities. 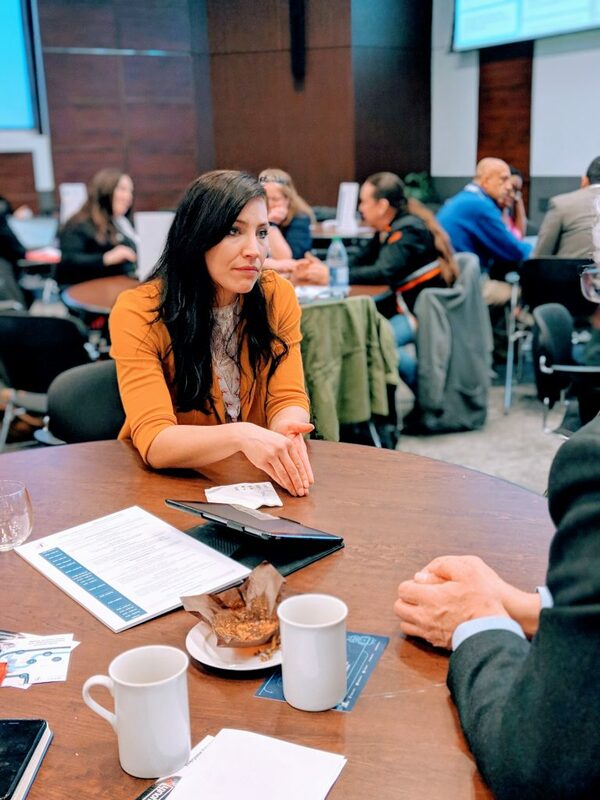 After hearing the Next Gen Education and Future of Work panels, participants went through a final brainstorm of Take-aways, Strategies and Actions. What are all the ideas, data points or nuggets that you are taking with you from today? What are all the steps or actions that you are inspired to take after today? What might we all do collaboratively to help Canada prepare for the future of work? Facilitator does a room-wide share in Stormz of the responses. Each triad was invited to take a selfie and create a postcard in Stormz to those who had missed the Summit. Participants were truly engaged in forward-thinking conversations and action planning. Their time spent at the summit and their diversity of expertise and knowledge were put to good use. A comprehensive report was produced, including the highlights of all the conversations that took place in triads. The organizers will be sharing the final report with all participants as well as using it to strengthen and inform policy recommendations.